On February 12, Frisal in South Kashmir’s Kulgam district thrummed with the news of local militants being holed up in a residential house. The security forces had cordoned off the place and were engaged in a gunfight with the militants. Twenty-two-year-old Nayeem* rushed to the spot, smartphone in hand, joining hundreds of boys at the encounter site. In an attempt to help the trapped militants escape, the young boys were throwing stones at the police and paramilitary forces. Nayeem opened the Facebook app on his phone and started live-streaming the chaos before him. It was his turn to use the new ammunition in Kashmir: Videos. Following the agitation in the summer of 2016 , when Hizbul Mujahdeen commander Burhan Wani was killed, the protests in Kashmir took a new turn, with more and more youths uploading videos on Facebook. Disillusioned by the portrayal of Kashmiris in mainstream Indian news media, young men took to live-streaming on Facebook – the videos, shot in real time, not only manifested the on-ground realities but also added a credibility to videos which left little room for manipulation. After the recent bye-elections, the video wars have taken a harrowing turn. When a video showing a group of men of the Central Reserve Police Force being heckled and kicked by some youths in Central Kashmir’s Budgam district surfaced online, it evoked major outrage across the country, with cricketer Gautam Gambhir calling for “killing 100 jihadis for every slap on jawans”. In response, counter-videos showing police assaulting young men in the Valley have flooded Indian social media, including a video which showed a civilian tied to an army jeep as a human shield. The video Nayeem shot in February, begins with the chants of a few young men in the background. Then, all that can be heard is the rumbling sound of gunshots. At some distance, a youngster lying face down on the ground tries to duck the bullets which seem to be coming from everywhere. After a while he frantically shouts “I am hit! I am hit!” The phone’s camera pans right and trails the young man, who runs until he falls down. A group of men surround him and try to cover his wound. The boy, later identified as a 24-year-old, succumbs to his injuries. In July 2016, the government clamped down on internet services in the Valley. After about six months, in January 2017, mobile data services were restored. 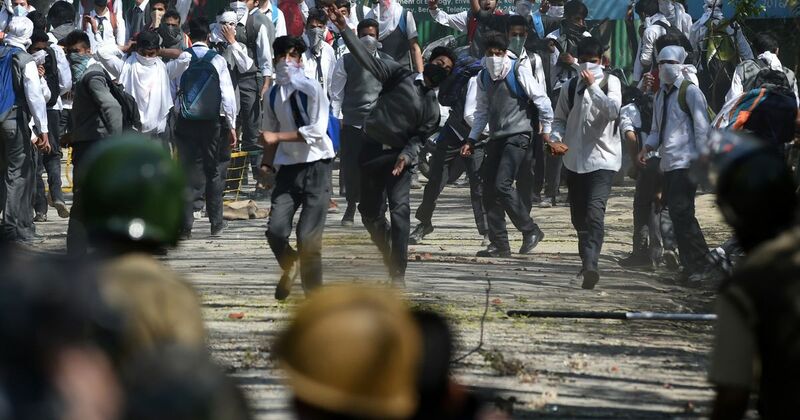 Following the clashes at Degree College, Pulwama on April 15, protests erupted in colleges across Kashmir on Monday, leading to further clashes between students and police outside and inside the college premises. As the Facebook Live videos of these protests flooded the social media, internet and broadband services in the Valley may be suspended once again. E-curfew to be imposed in the valley again. I believe the orders have been issued. Soon after protests against Wani’s killing started to abate, most young men in Kashmir acquired Reliance Jio SIM cards, which provided them with free 4G internet access. Equipped with free, high-speed internet, stone-pelting began to be live-streamed. On February 12, Frisal saw many young men with phone cameras live-stream the death. Hamid*, an undergraduate student, also went live from the spot multiple times on Facebook, broadcasting the stone-throwing closely. “My videos debunk the claims of police that they exercise maximum restraint, as they show how the government forces fire bullets at us in response to stones,” said Hamid. Earlier, stone-throwers had disallowed people from taking photos or recording videos, for fear of being tracked down by the police. Young men who take part in stone-throwing want the event broadcast in real time, so that “people understand how stones are answered with bullets”. Meanwhile, the police in Kashmir say that social media is being used by militant groups to influence the youth. The police consider the rampant uploading of violent videos to be “a threat to peace”, regardless of whether the videos depict officers being violent with civilians or the other way around. During a press conference on March 30, the Director General of Police Shesh Paul Vaid pointed out that social media was being used to instigate young men to throw stones, which helped militants escape the site. Police authorities in Kashmir claim to have traced the connections of some 10,000 Facebook profiles to Pakistan. These profiles, they believe, are being used to provoke the youth and encourage them to hinder security operations. They claim that militant groups control some 300 groups on WhatsApp. The Indian Chief of Army Staff General Bipin Rawat in February said that those who obstruct anti-militancy operations would be treated as “over-ground workers of terrorists”. He went on to warn the youth of stern action in case they continue to clash with forces during encounters and broadcast them in real time. Despite General Bipin Rawat’s warning, young boys like Hamid continue to clash with the government forces near encounter sites and ensure live broadcasts. In central Kashmir’s Chadoora, 14 kilometres away from Srinagar, hundreds of youth came out to clash with the security forces to help a militant trapped in a house escape on March 28. Zahid Rashid Ganai, 22, wanted to live-stream the video on his Facebook profile, but he was hit by a bullet in his neck and died before he could reach the hospital. When his body was being brought home in an ambulance, policemen stopped the vehicle near Lal Chowk and did not let it go further. One of the boys attending to the body live-streamed the entire episode through Facebook live. The video went viral within hours, evoking sharp criticism against the police action. Along with Ganai, two other boys were killed in police action near the encounter spot in Chadoora. The clashes between the youth and security forces continued for days after the encounter. 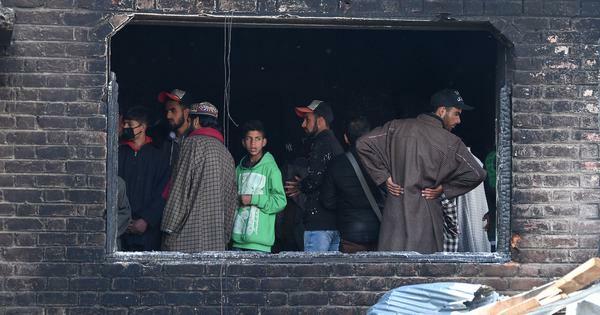 On April 9, during the bye-poll in Srinagar Parliamentary constituency, eight youths were killed and dozens injured in clashes with security forces. To thwart further protests, and spread of information and misinformation about protests, and the smooth conduct of polls, authorities shut down the internet services in the Valley. It also curbed Kashmiris from broadcasting the protests in real-time on Facebook – it did not, however, stop people from recording videos during the clashes, to be uploaded once internet services have resumed. To be on the safe side after the Chadoora episode, Mehraj has shared the videos with friends via apps like Shareit or Bluetooth. “When the videos are uploaded from multiple accounts, it is difficult for the police to trace the source,” he said.